PLEASE come get some and put them up where ever you think it will help. I keep finding spots where the missing posters are gone so I replace them with new ones and the “note”. Diana Totten: Thank you, this will help folks keep looking. 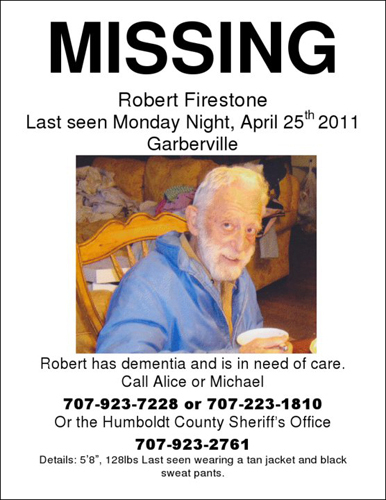 I am still following any leads that come in, but it is so much better to have thousands of people looking for some sign of Robert Firestone. This entry was posted in Missing Persons and tagged Diana Totten, Facebook, missing, photos, Robert Firestone, SoHumAwareness. Bookmark the permalink.